I came upon this website www.sewmuchcomfort.org reading another blog. This does not pertain to knitting (at this time) but to those of you that sew. It’s making or altering clothing that our soldiers need while in rehab, etc. Can entail just adding velcro to a side seam of shorts, sweatpants, etc. Please check it out and if you can help, please do. So many things are done for our troops in Iraq but those injured and in rehab need help also. Thanks! On Friday, March 23, this organization was Person of the Week on ABC News with Charles Gibson. Hopefully, this short segment will generate a lot of interest. 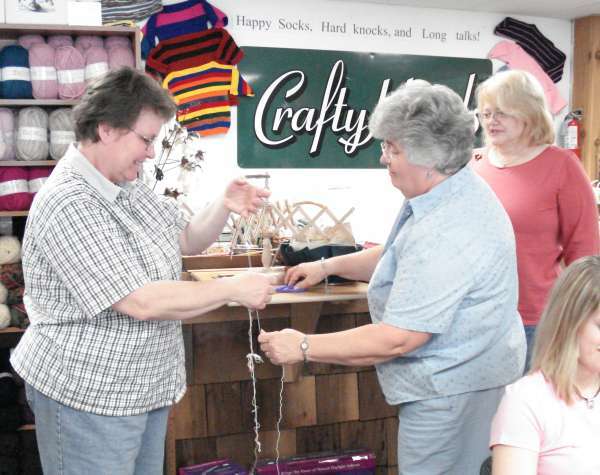 Starla, owner of Crafty Hands, is putting up another sweater that Monday’s Charity Knitting group has completed. She furnishes the yarn and needles and we just stop in and knit on a Monday whenever we can. At Christmas time a lot of sweaters, scarves and hats were donated to a local women’s shelter. Makes us all proud when more sweaters are added to the wall. To the left of her, are more completed sweaters. This picture shows Holly and Patsy from Crafty Hands working on “my mess”. Sukie (the blonde) is trying to oversee this project. 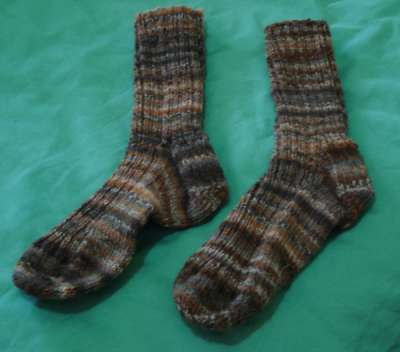 Have started another pair of socks, actually more like a short golf sock. Actually, I’ve started it 4 times as of this morning!!! Using the new Tofutsies yarn, very pretty and soft. I guess today is just one of those frustrating days; want to be outside because it’s so nice. Yes, I know I can knit outside, but I need the noise of TV and we don’t have the TV set up in the gazebo yet. Comments Off on Cute pink booties! So cute!!! 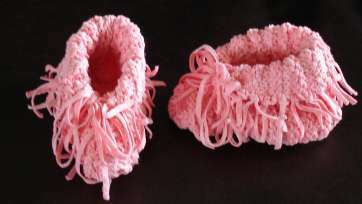 Another pair of Bethany booties that I wasn’t going to post, but the picture is just too cute!!! Aren’t they feminine in pink? Pattern is from the Berocco website, free. I’m working on a baby cardigan in self-striping sock yarn. Pattern is easy! However, I wish I would have combined the right front, back, and left front on a circular needle until decreasing for the sleeves. That way the stripe matches around the body of the sweater. Oh, well, now that I have the back and left front done, I don’t think I’ll “frog” it. But I might, you never know when the mood will hit and I’ll start completely over! However, I won’t make that mistake again when using self-striping yarn. Live and learn!!! Have been to Tucson, AZ and back! Takes me forever to get caught up the older I get.Visited 4 yarn shops while there. The two yarn shops in Tucson were a major disappointment to Velma and I. Not much variety and not much inventory. I understand it gets hot in Tucson but the evenings you would certainly want a sweater or shawl. Owners were very cordial and allowed me to take pics, etc. (of them). Two yarn shops were in Tubac, AZ – about 45 minutes south of Tucson. This reminded me of the neat and quaint shops in Sedona, AZ. These also had very little inventory – so little that I’m surprised they called themselves yarn shops. Once again, my local shop, Crafty Hands comes away a BIG winner!! !